Who doesn’t love a story that harks back to a simpler time, when technology wasn’t always in our faces, our natural landscapes were untouched, and it was easier to tell good from evil because the good guy was usually the one wearing the white hat? This is why so many people today love the comforting nostalgia of The Happy Hollisters by Jerry West— and why so many people in the 1950s and 1960s, when The Happy Hollisters was originally written, turned to the Western genre of film for entertainment. The Western genre is defined by the American Film Institute as a movie “set in the American West that embodies the spirit, struggle, and demise of the new frontier.” Though this definition might sound bleak, early Westerns were also filled with memorable characters, daring adventures, and exciting plotlines that involved things like train robberies, tense shootouts, and sweeping romances. This made Westerns an immensely popular genre, starting in the very early 1900s with The Great Train Robbery, a silent film. From the silent film era through the 1960s, many Westerns were met with critical acclaim and massive audiences, especially classics like High Noon, Shane, and The Wild Bunch. Since the Western genre has been a staple of film for many years now, it’s unsurprising that it has taken many forms. The past decades have spawned dozens of sub-genres of Westerns, ranging from science-fiction Westerns set in outer space to Westerns mixed with aliens, vampires, and other characteristics of horror films. One of the most well-known sub-genres is known as “Spaghetti Westerns,” and refers to often low-budget Westerns that were filmed in Italy during the 1960s and 70s. Regardless of the genre, many Westerns have similar characteristics. The setting, as described in the American Film Institute definition, is one of the things that really makes a Western a Western. Most Western classics are set in the American West, in states like Texas, Wyoming, and Nevada, as in The Happy Hollisters and the Cowboy Mystery. The setting is often vast and barren, punctuated with dusty towns or sprawling ranches. Oftentimes, the setting is a character on its own, as it shapes the lives of the people who live in it. The themes of justice, honor, and revenge are other major characteristics of the Western genre. In many Westerns, the main character is searching for some kind of retribution. Maybe a rival stole their cattle, framed them for a bank robbery, or even stole their sweetheart, sending the protagonist on a quest for revenge. In the end, the protagonist usually gets their justice, often after a dramatic pistol duel or wild chase, showing that for good people with honor and morals, justice will always prevail, even in such a lonesome landscape. Though Westerns often have scenes of gambling, debauchery, and lawlessness, they are still stories of justice, honor, and the triumph of good over evil. These days, Western movies are fewer and far between and are often reboots of old classics like True Grit or The Magnificent 7. The Happy Hollisters and the Cowboy Mystery is a classic Western mystery book for children, recently reissued in paperback and digital formats for a new generation of young readers, but unchanged since it was originally written in 1961. 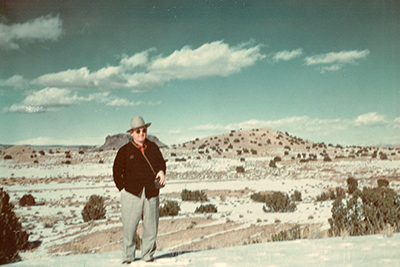 Author Andrew Svenson, who wrote the 33-volume Happy Hollisters series using the pseudonym “Jerry West,” was a member of the Western Writers Conference and traveled out west for on-the-spot research. In this exciting volume, the Hollisters are invited to the Tumbling K Ranch, home of their friends Bunky and Gina Blair, to track down the source of mysterious flickering lights on a mountaintop that are frightening the locals and threatening an important real estate deal for Mr. Blair. Their sleuthing is hindered by a suspicious cowboy named Dakota Dawson, as well as by a band of antelope rustlers. When rumors begin to swirl about a cache of gold that may be hidden in the mountains, the Hollisters mount up and pursue their clues and quarry on exciting horseback rides through the dusty and rocky hills of Nevada. The trail of clues helps them determine who the bad guys really are, and the flickering lights are extinguished once and for all.